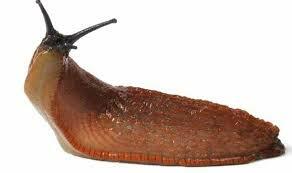 Slugs are a gardener's nightmare and efforts are made to eradicate the slugs. Damn things come out at night and munch on the greens in the garden. We squash them and poison them; or at least some people do. But, the humble slug has captivated the minds of medical researchers. The slime of the slug has been studied and now replicated with reasonable success. Its use as an adhesive is a medical break-through. The laboratory made slug slime is now emerging as an adhesive and is being used during surgery instead of staples and stitches. At least, it worked well during surgery on a pig. A great outcome by scientific study of the simple slug. The Leader Street Streetscape Project is now complete. Just a bit of asphalt to be laid near the railway line, booked for early August. The transformation of the street is fantastic. Looks great. It's green and cycle friendly with new cycle lanes. Prior to the road works there were no cycle lanes..
Rain-gardens were designed to filter stormwater and remove pollutants that would have normally been washed down creeks and into the ocean. These rain-gardens will filter about 5 million litres of stormwater annually. That's 2 Olympic sized swimming pools of water each year. Also, the new permeable footpaths have provided capacity to store 110,000 litres of water that will be 'soaked' into the soil and provide extra water for trees and vegetation. This streetscape renovation of Leader Street in Forestville is a pilot for transforming streets across Unley. Over time there will similar projects across Unley. It's been a good outcome. To lose one Greens Senator because he had dual citizenship was unfortunate. To lose a second within a week because another Senator just realised that she also had dual citizenship is totally irresponsible. Obviously the Australian Greens don't check and vet their candidates; at least not very well. Had they checked prior to the last election, then both of these Senators could have quickly dropped their foreign citizenship. The unfortunate aspect is that these 2 Senators were the Greens top performers. Most people actually liked and respected them. They had charm and appeal. I'm guessing that they will attempt a comeback at the next opportunity. Meanwhile, a couple of mediocre Greens will be promoted within the party to fill the void. Promoted through necessity and not by merit. This will probably result in a lower voter support at the next election. Why UberEats? Why? Why? It doesn't make sense. Just stupid. People are just doing it because it is new (and needs to be tried). My son ordered UberEats (= takeaway, home delivery) from a fav eatery on Goodwood Road, about 4km away. It was a wet and cold night and the food was delivered by bicycle. The food was cold; as you would expect after delivery by bike on a cold and wet night, on a journey from so far away. Stupid! Eat there or drive and pick it up. Just common sense. Yes, my son got Uber credit for a bad experience, but that's not the point. A bad food experience is totally not acceptable. It was all fine before Uber arrived. It hasn't impacted me, but the young are uberising many aspects of life; and creating a new norm. It's a bad business model that delivers cold food, bad service and leaves the consumer dissatisfied; and reflects poorly on the food outlets. The road and footpath renovation works are nearly finished. Now the last minute finer details are being done. I was amazing by the art work being installed in the windows set into the seats along Goodwood Road. Absolutely fantastic. It is not often that Council has me down on my knees, but that's the position I was in to take these 2 photos. A passer-by gave me a rather curious glance. 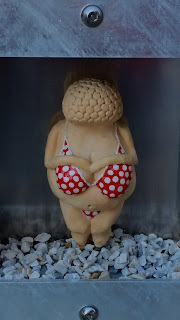 For those who want to find the bikini lady, she is in front of the chemist shop. Nothing annoys me more than an unsigned letter being left in the letterbox. However, the discreet camera out the front revealed who it was. Not that I was surprised; I had already guessed who it was. It just matched the pattern of this woman's past actions; and her past accusations. I just beg of you, this woman from Forestville, not to do what you say you will do. You will end up with egg all over your face; not from me, but from your own hand. Give the world a break and bury the conspiracies. Next time, sign your letter and be accountable for your wild accusations. Surprise, surprise ... Unley has been awarded a start in the 2018 Tour Down Under (TDU). It coincidentally 😉😉 was announced soon after the budget rate rise was endorsed by Council. Unley has been awarded the Stage 2 Start, from King William Road up to Stirling via the long way, a distance of 148.6km. Stage 2 will be held on Wednesday 17 January, 2018. The Gourmet Gala street party on King William Road will be held the night before. For the record, I oppose hosting this event for the 18th time at a cost of $266k. This equates to a cost of about $14 per household, funded by a rate rise of 2.9%. At Council, I opposed this budget expenditure. In my chats with residents, there seems to be little support for the huge cost of hosting this event. Most people would prefer a smaller, cheaper and more family event eg. like Unley Way to Go, like what we used to hold on Unley Oval. I doubt that Unley will host the event in 2019. The money saved can be used to pay off some debt.